I wanted to share with you apps that I use for editing my Insta stories. It's very interesting how Instagram "stole" the idea from Snapchat and now everyone is using Instagram stories. The idea behind the whole thing is to show the real life and everything that is happening right now. So it's raw and unfiltered. It was just the matter of time when everyone will come up with apps for it. And they did with so many of them! I was pretty excited about it because I love editing and putting stuff in a different perspective. I come up with an idea to share them with you because I get so many questions on a daily basis with the same question: what apps do I use for making video collages or picture collages. Let's start with apps for making collages and editing photos. First one on the list is VSCO Cam. This is my favorite app for editing photos for Instagram and IS. I always add clarity to my photos and one of my favorite filters A6 or A8. I never put them to the max! My favorite app for creating collages is PhotoGrid! I always use Scrapbook option so you can create collages however you want. If you ever watched my IS you could see that I have series of photos and everytime you click on the next story it's like you are doing a puzzle until it comes with all pictures and text (I hope you understand what I want to say). To create that, I'm using this app. I always save every collage, before I add another picture or text. This app is free and it has a watermark on it, but you can easily delete it, by clicking on it and pressing the X button. My latest discovery when it comes to apps for photos & videos is Unfold. You can use it for pictures and videos. It comes with a beautiful border and elegant font. You can change the background and add photo or video, or just text. You need to try it, it's so easy to use! If you want to make collages out of videos, you need to install FrameMagic! You can make collages mixed out of photos and videos. There are a lot of options: Freestyle, Slideshow, Video collage and many others. It's really fun to use and results are amazing. It's my go-to app when I want to mix videos in one collage. For Unfold goes the same as for the photos, except you are adding videos. 8mm is an app that gives you effect of filming with old cameras. I love using it. If you are a vintage lover, this one is for you! Last but not least is well known KiraKira app that Chiara Ferragni started using first! Everyone went crazy about it and no one wanted to tell which app is until recently. It gives you that sparkly effect. There is a free version of it, I heard it's called RicaRica. 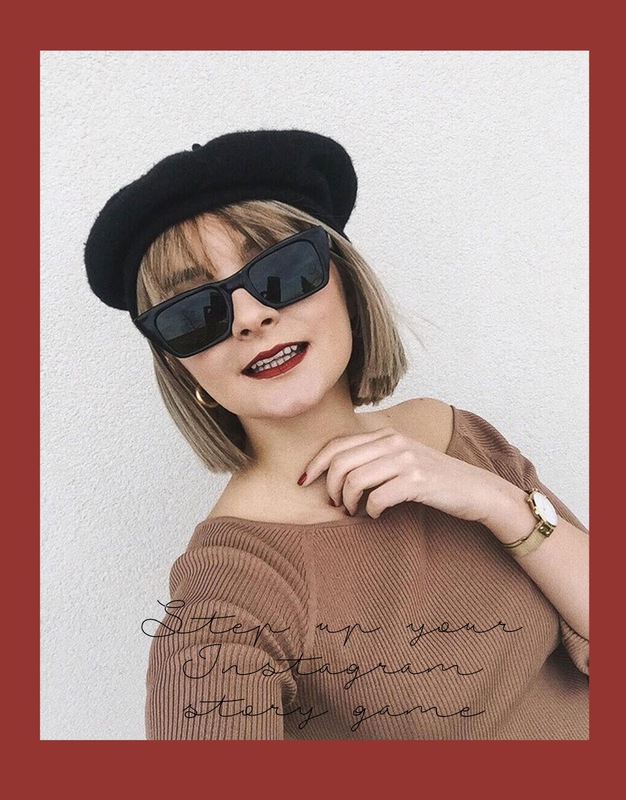 Do you edit your Insta stories? What are your favorite apps? I'm loving you boots so much!!!!!! Everyone is loving kirakira right now!! what would you recommend as an instagram scheduling app? Hey Amy, I would highly recommend you UNUM, I love using it! It's free and easy to use. Whoa these are some great apps. I am definitely going to try them out and step on my instagram stories game. I never thought of editing my insta stories really, and probably this is because I am using live video most. I find it the most successful way to reach a higher number of people with the insta stories. You look so beautiful, love the outfit. I am so glad you shared these apps, I so use insta stories regularly, these all sound great and worth checking out. Loving todays outfit, you never fail to look flawlessly beautiful! I hadn't heard of most of these so your compilation of apps was really helpful. I'll be looking a few of these up! I am using VSCO app for editing my pics, it is amazing! Thank you for sharing additional Insta tools, I'll check them. Ah this post came just in time :) I was actually looking at apps for my insta story earlier today :) Bookmarked for tomorrow ! Those are great resources. Thank you for sharing. I use a few of those apps. Had no idea about Unfold though. I'm saving this! I love playing around with vids on social media & you share some great ideas. Plus, you look fab! This is such great info! I can always up my Instagram game and these apps will be a huge help. I made a list of all of the apps you mentioned and will definitely check them out. You look gorgeous in your outfit. and I am loving so much your booties looks so fashionable. and I will give this app a try. KiraKira!!! I was wondering for so long. I have used VSCO for editing my Instagram posts but never my stories. I have never thought to use apps for my stories. It's an interesting idea for sure. I would love to be on Instagram, but being a personal finance blogger, I don't know how to create a place in photo based app!!! Brilliant post, I will be looking into the Unfold app for sure. Thanks for sharing. She is beautiful If it is not.